December 10 is the aptly wintry feast date of Saint Eulalia of Merida, a virginal girl of age 12 to 14 who was martyred for the Christian faith under Diocletian‘s western empire wingman Maximian. With the headstrong zeal of youth, Eulalia escaped from a pastoral refuge arranged by her mum and belligerently presented herself to the pagan authorities, daring them to martyr her. The pagans were game. [She] stood before the tribunal, amidst the ensigns of the empire, the fearless Virgin. which makes you lose your unthinking souls? Wasting away your love in adoring these chiselled lumps of stone, whilst you deny God the Father of all? O wretched men! You are in search of the Christians: lo! I am one; I hate your worship of devils: I trample on your idols; and with heart and mouth I acknowledge but one God. Isis, Apollo, Venus, all are nothing; Maximian, too, is nothing; they, because they are idols; he, because he worships idols; both are vain, both are nothing. Maximian calls himself lord, and yet he makes himself a slave of stones, ready to give his very head to such gods. And why does he persecute them that have nobler hearts? This good Emperor, this most upright Judge, feeds on the blood of the innocent. He gluts himself on the bodies of the saints, embowelling those temples of purity, and cruelly insulting their holy faith. Do thy worst, thou cruel butcher; burn, cut, tear asunder these clay-made bodies. It is no hard thing to break a fragile vase like this. But all thy tortures cannot reach the soul. Away, Lictor, with this senseless prattler, and punish her in every way thou canst. Teach her that our country’s gods are gods, and that our sovereign’s words are not to be slighted. Yet stay, rash girl! Would I could persuade thee to recall thy impious words before it is too late! Think on all the joys thou thus wilt obtain; think on that noble marriage which we will procure thee. Thy family is in search of thee, and thy noble house weeps and grieves after thee, their tender floweret so near its prime, yet so resolved to wither. What! are nuptials like these I offer not enough to move thee? Wilt thou send the grey hairs of thy parents into the tomb by thy rash disobedience? Tremble at least at all these fearful instruments of torture and death. There is a sword which will sever thy head; there are wild beasts to tear thee to pieces; there are fires on which to burn thee, leaving to thy family but thy ashes to weep over. And what do we ask of thee in order that thou mayest escape these tortures? Do, I beseech thee, Eulalia, touch but with the tip of thy finger these grains of salt and incense, and not a hair of thy head shall be hurt. The Martyr answered him not: but full of indignation, spat in the tyrant’s face; then, with her foot, upsets idols, cakes, and incense. See, dear Jesus, they write thee on my flesh! Beautiful letters, that tell of thy victory! O, how I love to reac them! So, this red stream of my blood speaks thy holy name! Saint Eulalia by John William Waterhouse (1885) is one of the most unique and outstanding exemplars of the Pre-Raphaelite style. Thus sang the joyous and intrepid virgin; not a tear, not a moan. The sharp tortures reach not her soul. Her body is all stained with the fresh blood, and the warm stream trickles down the snow-white skin. But this was not the end. It was not enough to plough and harrow up her flesh: it was time to burn: torches, then, are applied to her sides and breast. Her beauteous locks dishevelled fell veiling her from worse than all their butchery, the stare of these wretches. The crackling flame mounts to her face, and, running through her hair, surrounds and blazes over her head. The virgin, thirsting for death, opens her mouth and drinks it in. Suddenly is seen a snow-white dove coming from the martyr’s mouth, and flying up to heaven. It was Eulalia’s spirit, spotless, eager, innocent. Her soul is fled: her head droops, the fire dies out: her lifeless body sleeps in peace, while her glad spirit keeps feast in its ethereal home, and this sweet dove rests in the house of her most High God. The executioners, too, see the dove issuing from the martyr’s mouth: astonished and trembling they flee from the spot. The lictor, too, is seized with fear and takes to flight. 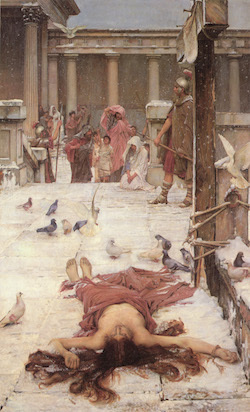 ‘Tis winter, and the snow in thick flakes falls on the forum, covering the tender corpse of Eulalia, which lay stiffening in the cold, with its fair pall of crystal. Ye men that mourn at funerals, weeping and sobbing out your love for the dead, ye are not needed here: give place. God bids his elements, O Eulalia, do the honours of thy exequies.